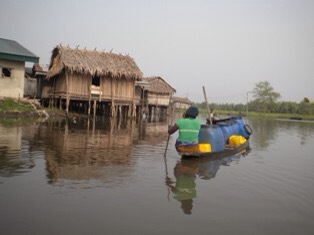 This is how the people of Polobubo/Opuama transport water (basic necessity) from the Chevron platform to their homes. 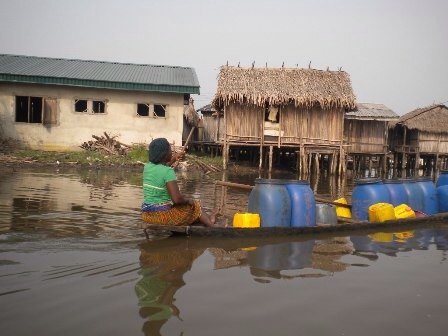 Can you imagine how the old, frail and disable people in the community who can’t make the water journey – survival? It is easy for the oil companies to come to OML 40 communities drill oil wells but unable to drill water wells for the people of the community for their use! Shell spent over thirty years without any provision of drinking water for the people of the OML 40 communities. Today, eLand Oil and Gas with joint venture Nigerian Petroleum Development Company (NPDC) operating the OML 40 wells with the prospect to drill more oil wells without engaging with the host communities – no clear and comprehensive Corporate Social Responsibility (CSR). A typical day in Polobubo/Opuama – is this moral and ethical? Join the campaign #savePOLOBUBO #saveOPUAMA – the people of Polobubo/Opuama deserves to be treated with dignity and respect! 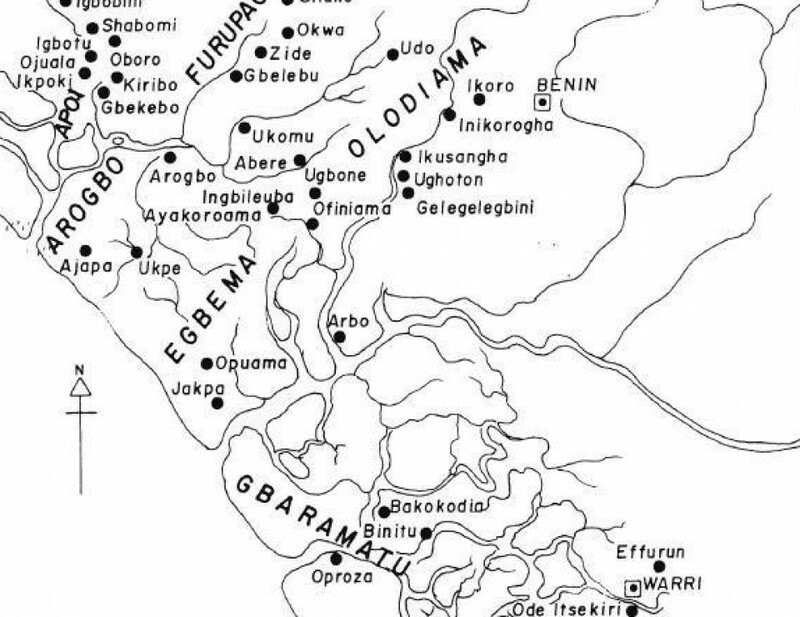 The ancient Kingdom of Egbema is politically split into the present day Edo and Delta States of Nigeria. Egbema Kingdom is bounded on the north by the Olodiama of Edo State and the Itsekiri of Delta State, west by the Arogbo Kingdom of Ondo State, east by Gbaramatu Kingdom and the Itsekiri of Delta State and South by the Ilaje of Ondo State and the Atlantic Ocean. The Egbema people are the most likely Ijo sub-group to which the allegation of Ijo piracy on the Benin River could have made. The only other sub-group with access to the Benin River are the Gbaramatu. Egbema traditions, in fact, give indirect evidence of their predatory activities in the region of the Benin River. While they refer to the Oba of Benin as Ugbo Pere (lord of the Lands), the priest king of Egbema was Bini Pere (lord of Waters). Apart from cultural and other relations with other Ijo groups, therefore, Egbema history was affected by relations with the Benin Empire to the North, and with the Itsekiri to the south and with white traders in slaves on Benin river and its estuaries. The dual relationship with the Edo and the Itsekiri is now reflected in the demarcation of the Egbema into the administrative areas of the Benin Division and Warri Division. He is a man with a plethora of prefixes to his name. 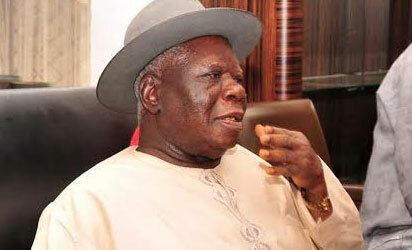 Former senator, former federal commissioner, former Midwestern Commissioner, former headmaster among others, but consistent social and political commentator, Chief Edwin Clark, in this gives his role in the remaking of Nigeria, his role in the process among other issues. The National Conference has come and gone. Many say it was five months of robust discussion. Would you say that the conference was a panacea to Nigeria’s major problems? I think before we talk about that, the first thing we should go about is to congratulate Mr. President, Dr. Goodluck Ebele Jonathan for taking the bold step in convoking that conference which many Heads of State in the past reluctantly refused to convoke for one reason or the other. There were those who were asking for sovereign national conference. There were others who were asking for national conference. Remember people like Gani Fawehinmi, even Tinubu: these were people who were talking about national conference and for a very long time, nobody cared about it. But when we formed the Southern Nigeria Peoples Assembly, we went to Mr. President, appealed to him on several occasions, argued with him. He had his own case. And he said, yes, there are problems in Nigeria that cannot be solved by amendments to the constitution alone and finally he agreed to convoke a national conference. He did not just only announce it, he set up a committee under Senator Femi Okurounmu who used to shout in the Senate as if that was the only purpose for which he was elected into the Senate. So, the committee went round the country, saw the modalities and everything and how it should be organised. This is just an insight to what oil does to the environment…this is what the people of Polobubo/Opuama community are daily going through! Nigeria’s Niger Delta is one of the most oil-polluted places on the planet with more than 6,800 recorded oil spills, accounting for anywhere from 9 million to 13 million barrels of oil spilled, according to activist groups. But occurring over the 50 years since oil production began in the Delta, this environmental disaster has never received the attention that is now being paid to the oil-spill catastrophe hitting the U.S. Gulf coast. “The whole world is trembling and even the president of America had to do a personal visit to the site. The U.S. will have put serious measures in place to stop such situations happening in the future,” said Ken Tebe — a local environmental activist who is visibly shaken by what he regards as a double standard. “It’s funny because we’ve been dealing with this problem for 50 years. I even heard BP will pay $20 billion in damages (for the U.S. spill). When will such hope come to the Niger Delta?” Tebe asked. We the Izon (Ijaws), the predominant indigenous people in the Niger Delta, moved to the Delta over 7,000 years. We have a distinctive language. The Niger River Delta, one of the largest and beautiful deltas in the world, is the largest delta in Africa, and it covers approximately 14,000 square miles (36,260 square kilometres). Its origination is in the highlands of the Fouta Djallon Plateau in western Guinea 150 miles (240 kilometres) from the Atlantic Ocean. The Niger River is Africa’s third longest river covering approximately 2,600 miles or 4185 kilometres. It flows northeast into Mali. In central Mali, the Niger forms a vast inland delta, a maze of channels and shallow lakes. Just below Timbuktu, the Niger bends, flowing first east, then southeast from Mali through the Republic of Niger, and finally into Nigeria. At Lokoja in central Nigeria, the Niger is joined by its chief tributary, the Benue. The Niger then travels south 250 miles or 400 kilometres, becoming a great fan shaped delta before emptying into the Gulf of Guinea. The Ijaws have called this delta home for over 7,000 years. The Niger Delta covers an area of about 70,000 square kilometre, and is spread across eight of the 36 Nigerian states. These are Bayelsa, Delta, Rivers, Edo, Akwa Ibom, Ondo, Abia and Imo. It is endowed with immense natural resources, particularly crude oil.